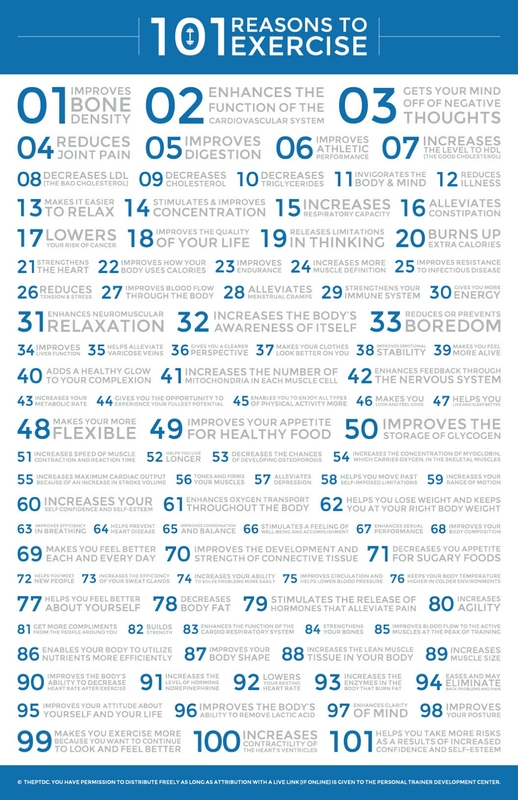 101 Reasons to Exercise | Coach Billy. We all know that regular and consistent exercise is beneficial to everyone. We can never run out of great reasons to exercise! However for most people in this busy society we live in today, exercise still falls below the top 10 priorities in our “to-do” list. I mentioned in a previous article how the FITT principle determines the outcome of any exercise or training regimen. Simply put, the FITT Principle states that exercise has to be FREQUENT with the appropriate INTENSITY to achieve specific goals, which determines how much TIME will be spent and what TYPE of exercises has to be done. For example, a low-intensity workout consisting of movements such as walking or swimming, has to be done for a little longer period (at least 30 minutes) to achieve cardiovascular (heart and lung) endurance for 3 to 5 times a week. Some research today on High Intensity Interval Training (HIIT) indicates that training at a high intensity for less than 10 minutes a day at 3 times a week can achieve sufficient health gains. However in my opinion, I don’t think that the proposed 10 minute (or less) HIIT workout is a good recommendation for everyone. The principle of Individuality should be applied and take into consideration the fitness level of an individual before undertaking any HIIT program. It also boils down to each individuals exercise preferences and goals. For example, an adventurous person who aims to improve cardiovascular and even muscular endurance and wants to be fit so that she can last on long-duration activities such as running, swimming, or hiking will benefit more from low-intensity endurance training. On the other hand, a busy office person who has been going to the gym and is used to being on-the-go can benefit enough from HIIT, if her goal is only to maintain her fitness level and squeeze in an exercise routine to her busy schedule. In any case, regular exercise results in a myriad of benefits that not only helps us prevent chronic disease, but improves our quality of life. Exercise will not only make us live longer, but enjoy life better. If you are not thoroughly convinced, here’s a simple infographic from the PTDC – a great resource for Personal trainers and fitness enthusiasts – showing 101 reasons to exercise. “75 and still alive.” Exercising in Old Age.